Southampton, PA. – CW Industries Fully Enclosed “G” series micro miniature slide switches are capable of switching up to .05 amps @ 125VAC with electrical contacts that are completely enclosed for protection from hostile environments. 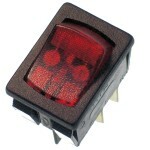 Theses switches are micro miniature in size and available in SPST and SPDT positions. Two mounting options are available with no mounting hardware required. Snap-in for panel mount applications or Plug -in for mounting directly onto a printed circuit board. Serving customers since 1904, CW Industries is a vertically integrated design and manufacturing company serving many of the leading industrial, consumer and defense electronics manufacturers with complex electromechanical slide, rocker and pushbutton switches; insulation displacement and MIL SPEC connectors; and a variety of custom switches, custom connectors and assemblies that require a high level of precision, performance and reliability. Our in-house capabilities include molding, plating, stamping, tooling, CNC machining, welding and assembly. Southampton PA – C W Industries, a long recognized manufacturer of switches, connectors, customs and contract manufactured products for the OEM, has developed a line of Power and Signal Connectors where the power and signal contacts are contained within the same base. The CWN-712,713, 751 and 752 series two-in-one connectors are available up to 50 signal pins with 4 power pins. 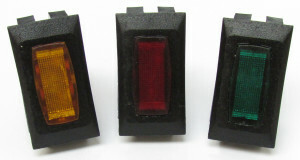 The CWN-763 series is a three- in-one connector with 40 signal pins, 4 power pins and 3 battery pins. The contacts are available in straight and right angle for simplified PCB assembly. The connectors are made to withstand immersion in the solder wave at 260°C for 10 seconds with no physical or cosmetic damage, and 3 cycles (5 seconds each) of 1 R at 235°C. They operate at -55°C to 125°C with contact ratings of 1 amp per signal contact and 3 amps per power contact. 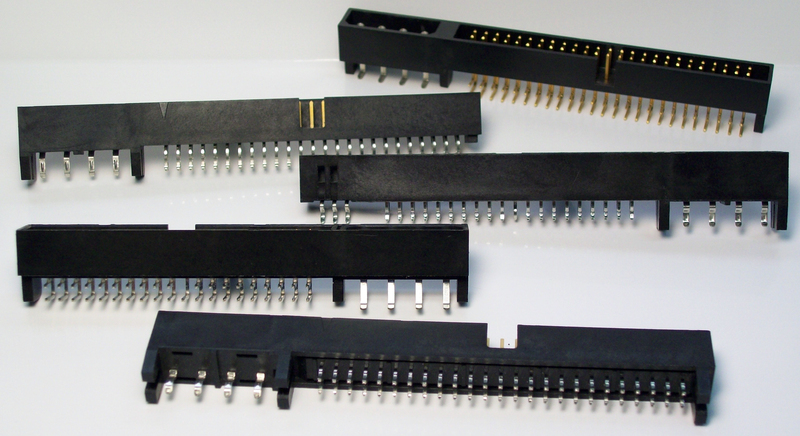 These space savings connectors are used in many applications where power and signal connection requirements are needed such as medical equipment and devices, missile systems, mobile radios, combat vehicles, servers, storage systems and disc drives. 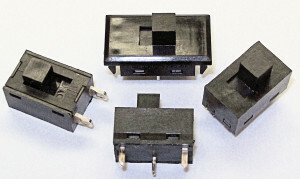 The fastest growing segment for this product line is our custom capabilities where the number of power and signal contacts may be specified in low profile / high contact amperage designs that provide the user design flexibility while ensuring that the connector is kept to the absolute minimum size. Serving customers since 1904, CW Industries is a World Class Manufacture serving many of the leading industrial, consumer and defense electronics manufacturers with complex electromechanical slide, rocker and pushbutton switches; insulation displacement and MIL SPEC connectors; and a variety of custom switches, custom connectors and assemblies and contract manufactured parts that require a high level of precision, performance and reliability. CW Industries is ITAR Registered, ISO 9001 Certified and our in house test facility is qualified to UL, CSA and DOD standards. For additional information, contact Jon Schott at CW Industries, 130 James Way, Southampton PA, 18966. Phone: 215-355-7080. Email: jschott@cwind.com. CW Industries, a long recognized manufacturer of switches, connectors and custom components for the OEM, is pleased to introduce a new LED illuminated miniature rocker Switch in a Momentary Function for users with applications requiring a spring return. Rated at 8 Amps, 14VDC, the CW GRL-4011B-0000 features an (ON) – OFF function in a SPST circuit. The GRL-4011B-0000 mounts into a panel openingof .756’’X .508’’requiring no mounting hardware and has standard .187’’ terminals. The standard actuator is made of red polycarbonate and the housing is made of black nylon. A wide range of options are available including color, terminal type -.110” and polarizing means for switch mounting orientation. The LED lamp is configured for direct application to 14VDC at 100,000 hours. The entire line of CW 4000 Series Switches feature self cleaning contacts and are RoHS compliant. For more information and technical specifications, contact Jon Schott at CW Industries, 130 James Way, Southampton PA, 18966. Web: www.cwind.com. Phone: 215-355-7080. Email: jschott@cwind.com. CW Industries, a long recognized manufacturer of switches, connectors, custom components and contract manufactured parts for the OEM, has appointed Electronic Marketing Associates- EMA as their new Sales Representatives in Dixie and Florida. EMA is one of the oldest electronic rep firms in the country and has been operating in the Dixie states for over 40 years. Serving the southeastern US states from their corporate headquarters in Raleigh, EMA is a 13-person agency with two fully staffed offices – Raleigh and Huntsville with the other local markets supported by field sales reps working from individual offices. EMA has many years of extensive experience and provides in depth technical support for their principles in the assigned territory. EMA will represent CW from their offices in North Carolina, Georgia, Florida and Alabama. Serving customers since 1904, CW Industries is a World Class Manufacturer serving many of the leading industrial, consumer and defense electronics manufacturers with complex electromechanical slide, rocker and pushbutton switches; insulation displacement and MIL SPEC connectors; and a variety of custom switches, custom connectors and assemblies and contract manufactured parts that require a high level of precision, performance and reliability. CW Industries is ITAR Registered, IS0 9001 Certified and our in house test facility is qualified to UL, CSA and DOD standards. Southampton, PA. – CW Industries, a long recognized manufacturer of switches, connectors, custom components and contract manufactured parts for the OEM, has appointed Quality Sales Inc – QSI as their new Sales Representatives in Indiana and Kentucky. QSI is a manufacturer’s representative agency, specializing in the electronic & electrical component industries. Based outside of Cleveland, Ohio, their coverage for CW Industries now includes Indiana and Kentucky as well as Ohio, Western Pennsylvania and West Virginia. The management and personnel at QSI have extensive experience and sound relationships throughout their markets, including customers, distribution partners, manufacturers & other industry professionals. These relationships are built on integrity, trust, communication and delivery of quality products. CW Industries, a long recognized manufacturer of switches, connectors and custom components for the OEM, has developed a custom backlit 16 position Rotary Encoder with a 4 channel hex output for military and commercial channel select applications. These switches are compact, have multiple positions and are customized to fit easily into an existing panel opening – as small as 12mm. Our designs also feature a durable enclosed construction that prevents EMI and are sealed to protect against environmental ingress. Easily mounted onto a PCB, the switch design allows multiple functions and output codes with its single shaft. 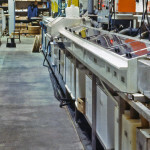 The CW product conserves panel space without compromising performance and every project is produced to the unique specifications of our customers with low minimum order requirements. For more information and to review your custom design requirements and application, please contact Jon Schott at CW Industries, 130 James Way, Southampton PA, 18966. Phone: 215-355-7080. Email: jschott@cwind.com. CW Industries, a long recognized manufacturer of switches, connectors, custom components and contract manufactured parts for the OEM, has appointed Associated Manufacturers Representatives (AMR) as their new Sales Representatives in Illinois, Wisconsin and Minnesota. Founded in 1977, AMR is a multiple person agency covering the states of Northern Illinois, Wisconsin, Iowa, Indiana, Nebraska, Minnesota, & Michigan. AMR’s primary goal is to assist design & mechanical engineers in the development of new product applications. AMR’s success is the result of total commitment to their customers and principals, superior service and over 100 years of combined sales experience. AMR can be contacted at Associated Manufacturers Representatives, 140 W. St. Charles Rd, Suite B, Villa Park, IL 60181. Phone: 630-530-7180. E mail: main@amr-inc.net. Web: www.amr-inc.net. For more information, contact Jon Schott at CW Industries, 130 James Way, Southampton PA, 18966. Phone: 215-355-7080. Email: jschott@cwind.com.